When I go to a restaurant for brunch, I want something good. Really good. There will be no yogurt parfaits at my brunch out. Those are relegated to weekday mornings (oh, and how I love those parfaits). Nope, when I go out on the town for brunch, there will be some sort of fatty meat involved, preferably bacon and some sunny yellow poached egg yolks sitting atop a golden brown English muffin. By the way, the fact that I refer to brunch at a restaurant as “going out on the town” should tell you how often we actually venture out of our house for meals. We spent a lifetime’s worth of “going out to eat” money when we lived in New York City. Seriously, between the monthly garage fee and our restaurant budget, it’s a wonder we had a place to live. Do I ever love New York City but, man, it is a penny-pincher’s worst nightmare. So what is a Egg Benedict-loving person to do on all those non-restaurant brunch mornings? Learn to poach an egg, of course (see How to: Poach an Egg). I don’t typically have the inclination to whip up a lemony Hollandaise sauce on a lazy morning, so I found a way around this. Yummy sauces and spreads. I first experimented with egg-loving sauces when I made one of my favorite egg dishes, Poached Egg on Toast with Chipotle Mayonnaise, Bacon & Avocado. That smoky, spicy mayo gave my friend, Hollandaise, a run for its money. So, I started playing around with other options. By smashing together black beans, olive oil, cumin, cilantro and a dash of salt and pepper, I came up with this spread that almost didn’t make it onto the English muffin. It kept trying to take a detour onto a fork…on the way to my mouth. Perched on top of that spread, some creamy slices of avocado and golden brown English muffin, those poached eggs didn’t look as though they missed their creamy, saucy sidekick in the least. And guess what? I didn’t either. The tastes touched every part of my tongue on the way down to my satisfied stomach. When made with whole wheat English muffins and paired with tomato salsa, this dish is actually very healthy. If you are watching your cholesterol, consider eating just one of these. Fill up on additional fruit instead or eat the second half of the English muffin with all of the toppings, except the egg. Healthy fats come from the touch of olive oil in the spread and the avocado, and there’s a punch of protein from both the eggs and the black beans. The best part? You can eat this without ever changing out of your pajamas. 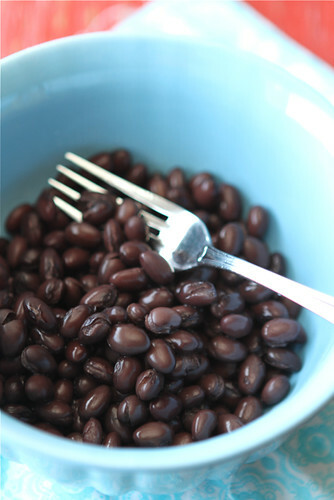 In a medium bowl, combine black beans and olive oil. Mash with a fork until the black beans are crushed and the mixture starts to stick together. 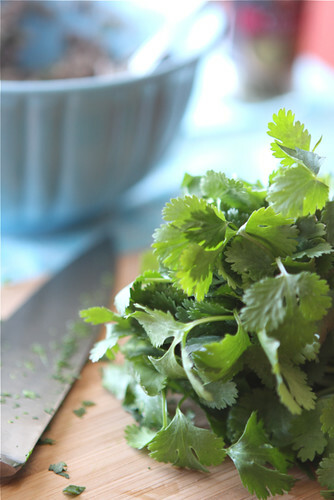 Add ground cumin, salt, pepper and cilantro. Stir to combine. Split English muffins in half crosswise and toast until golden brown. Place two halves on each of four plates. Divide the black bean mixture evenly between the English muffins and spread. Top with avocado slices. Poach and drain eggs (See my post on How to: Poach an Egg. It’s easy. I promise. ), set one on top of each prepared English muffin and garnish plate with dollops of salsa. Serve immediately. Split English muffins in half crosswise and toast until golden brown. Place two halves on each of four plates. Divide the black bean mixture evenly between the English muffins and spread. Top with avocado slices. Poach and drain eggs (see my post on How to: Poach an Egg), set one on top of each prepared English muffin and garnish plate with dollops of salsa. What a great idea for breakfast. I know what you mean about wanting something more on the substantial side when having brunch. 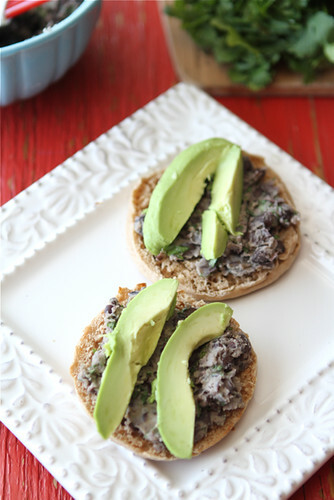 Love the idea of making this black bean spread on the english muffin. Sounds super delicious. I really like this idea! I too like something REALLY good when I eat out for breakfast! You know, this meal would be a good dinner too! This looks extremely good. I’ve never thought of using smashed black bean with eggs before-brilliant! What a great twist on eggs benedict! Can’t wait to try this one out! These look perfect! 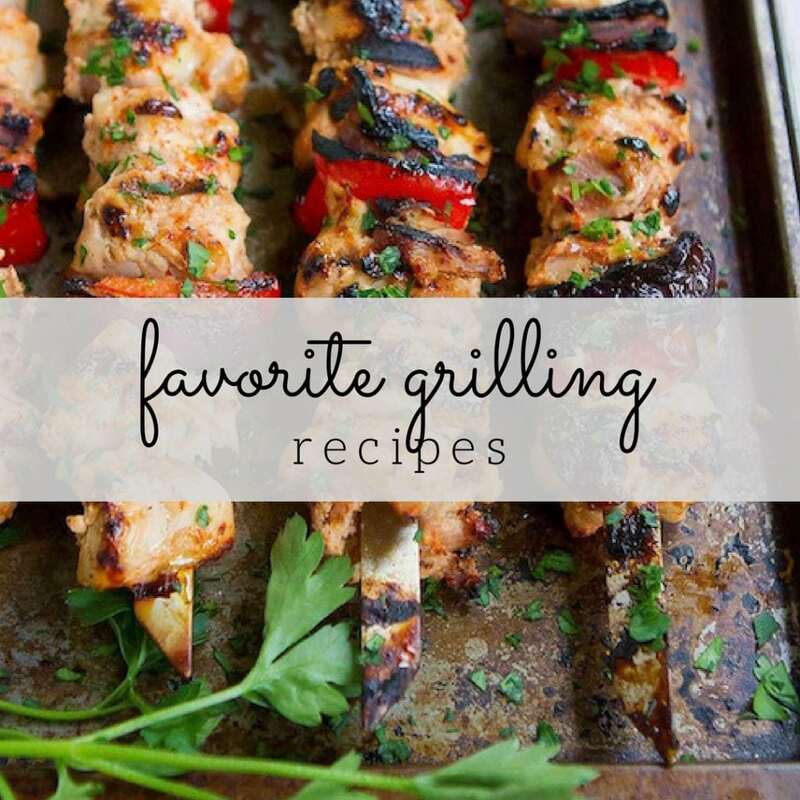 This is actually one of my all time favorites, it’s my total comfort meal. What wonderful pictures. This dish looks fantastic. Come visit. We have have some great features this week. I really can’t wait to try this. This combines so many of my favorites into one really perfect package. Outstanding, Dara! A poached egg is a nearly perfect food, and especially great this time of year when most of us are trying to, ahem, re-set. I like the idea of this almost-huevos-rancheros, and think it would make a fine lunch, pared down to one portion for some of us work-at-home people. I’ve even been putting poached eggs on top of onion soup instead of cheese, to keep on track with my January eating plan. Happy New Year! Oh Dara that last picture makes me weak in the knees! Whoa! “Do I ever love New York City but, man, it is a penny-pincher’s worst nightmare.” — UH, AMEN. Ahem. What I meant to say is, I love this take on Eggs Benedict–hollandaise and I don’t always get along, but I love me some southwestern flavors. I’ll definitely be trying this soon, for breakfast, lunch, OR dinner! My husband loves Eggs Benedict, and he is also an avocado farmer! What variety of avocado did you use? Our Fuerte avocados are perfect right now…or did you use Hass? I’ll be sharing this post on our Facebook page today: Facebook/Avocados_Direct. Thank you! Hi Mimi – An avocado farmer, huh? Now that sounds like an avocado lover’s dream! 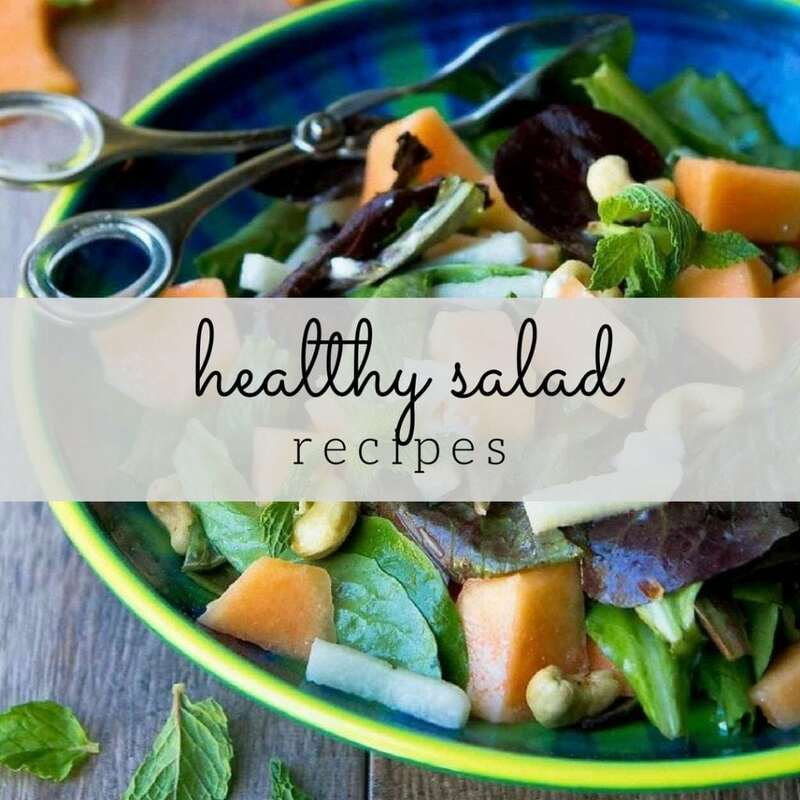 I used Hass avocados from California for this recipe because that’s what I could find in the store. I’ll have to keep my eyes peeled for Fuerte avocados. What a hearty breakfast! Will have to try this one at our house. This breakfast has all of my absolute favorite things on it! Looks delicious! Love those oozy gooey eggs & I want your handsome red table!! Have a great weekend Dara! I think you’ve outdone yourself this time. Going to save this to wow the girls at a girls weekend! I love eggs benedict but this really ramps up the flavor! Yum. wasn’t. I love these flavors. We eat quite a bit of beans and salsa, so I even have the ingredients on hand! I love when classic dishes get reinterpreted through the lens of another culinary tradition. The results are often fantastic—and this looks like one of those! Is there anything better in this world than a perfectly poached egg? The benedict looks great, but I’m in LOVE with the plate its sitting on. Hi Dara. As always, your photos are spectacular. (love the square plate!!) 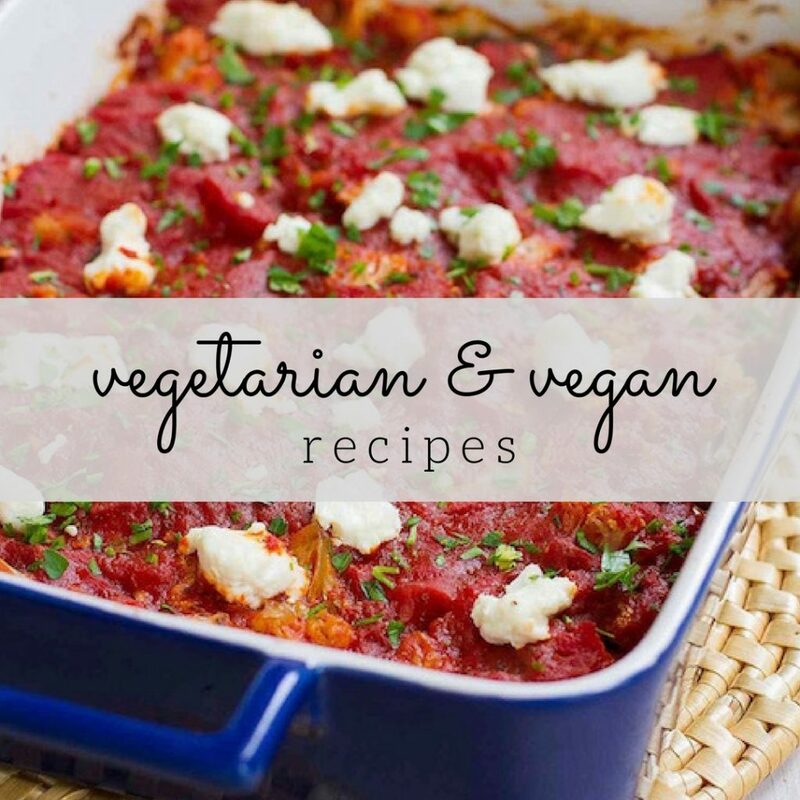 This looks absolutely delicious, like many of your recipes, I’ve bookmarked it. Hope you have a wonderful weekend!! What a hearty meal! I could eat that any time of day! goodness gracious, this looks good. 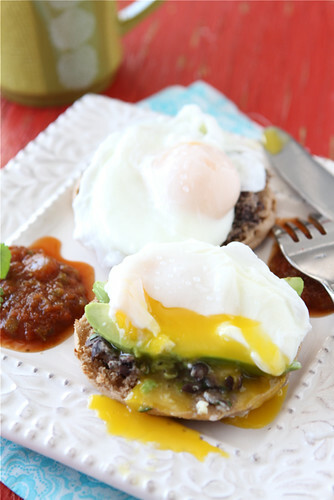 i love making egg breakfasts with beans, avocado, and salsa anyway – but on an english muffin? yum. 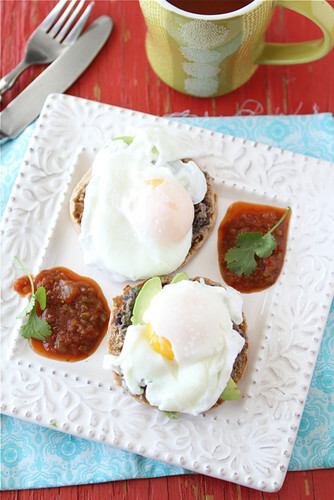 It’s no surprise that this sounds fantastic to me… my favorite breakfasts are always Mexican inspired. I will definitely be trying this out! You have this breakfast-food-loving girl drooling! I’m not huge on eggs in the morning but this looks amazing… plus I could eat it for dinner too right?! These would certainly make for a tasty breakfast!